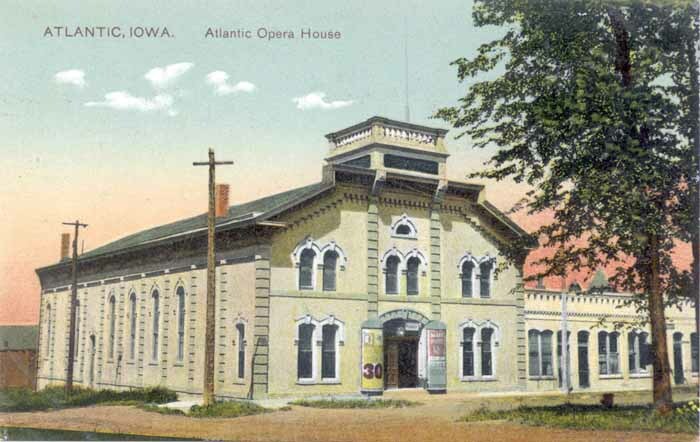 Opera houses were an important center for entertainment in "civilized" Iowa communities during the late 1800's and early 1900's. Anita, Atlantic, Cumberland, Griswold, and Massena all had opera houses. The opera house was a building where people could go to see a famous theatrical or musical artist perform, see a talent show or the latest touring production. 5. Atlanta, also known as Atlantic Opera House ca. 1896, managed by Lester L. Tilden (1896), C. P. Hubbard (1901-1909), W. P. Frost (1914-19??) and Fred Herbert (1921), seating capacity 528. Glenn and Poole cite conflicting information regarding current usage of Bacon Opera House, "Some say it was torn down. Some say it currently is a movie theatre." 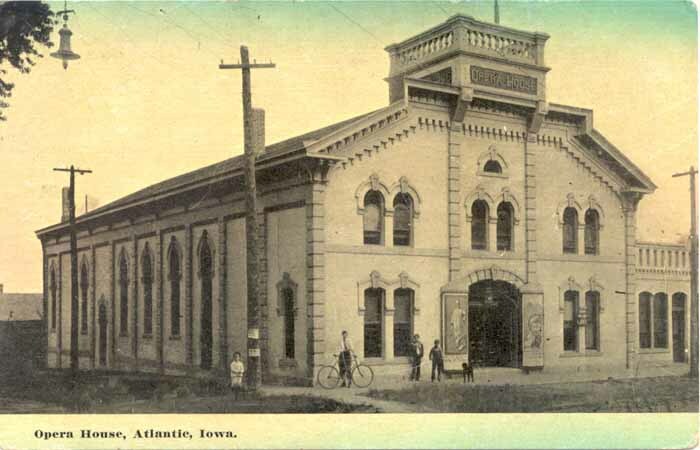 The "History of Atlantic 1888-1968" published by the Chamber of Commerce for the Atlantic Centennial indicates that the Bacon Opera House building is the one occupied by the Atlantic Theatre in recent years. History of Atlantic, Iowa 1868-1968, published by the Atlantic Chamber of Commerce, April, 1968, pp. 44-45. The Opera Houses of Iowa by George D. Glenn and Richard L. Poole, Iowa State University Press, Ames, Iowa, 1993. The first photo post card above (top of the page) is signed Grace M., addressed to Mrs. Lyman Richman, Griswold Iowa and postmarked Cumberland, Iowa, 1912. Contributed by Cheryl Siebrass, October, 2009. The post card at the bottom of the page is postally ununused,contributed by Cheryl Siebrass, May, 2010.